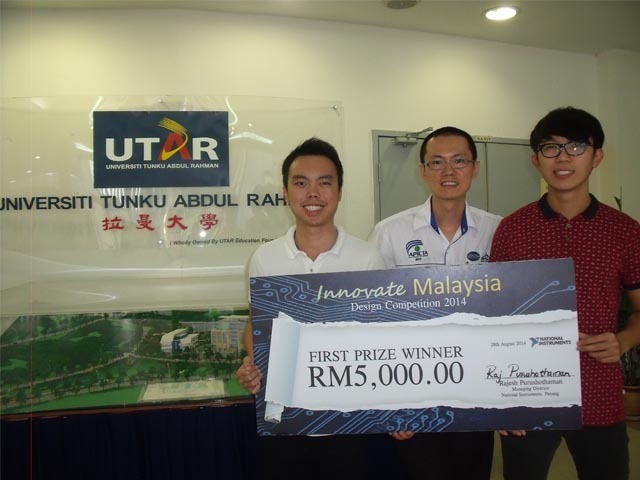 Three UTAR Faculty of Engineering and Science final year students won the Grand Prize (National Instruments Track Category) in the grand finale of the Innovate Malaysia Design Competition (IMDC) 2014, held in Penang on 28 August 2014. The winning trio, comprising Alvey Hau Lee Chuen, Nicoline Saw Ying Jie, and Chok Eu-Tjin were over the moon as the grand win came successively after their third prize win at the same competition in July last year. They received a cash prize of RM5000 as well as a Lego Mindstorms kit each from National Instruments Penang Managing Director Rajesh Purushothaman. IMDC 2014 was jointly organised by Altera, Intel, Keysight, MathWorks, Microsoft, National Instruments, and Silterra, which are leaders in electronic instrument, programmable logic, microprocessor, numerical computing, software, control automation, and IC fabrication respectively. 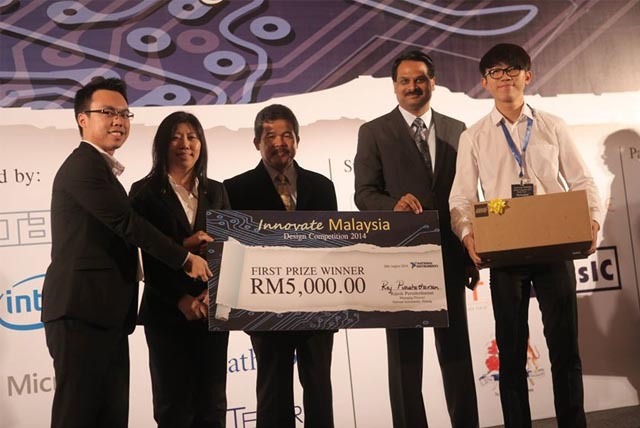 The competition saw participants from a total of 29 universities within Malaysia, and their entries were developed and designed systems applications based on designated platforms. 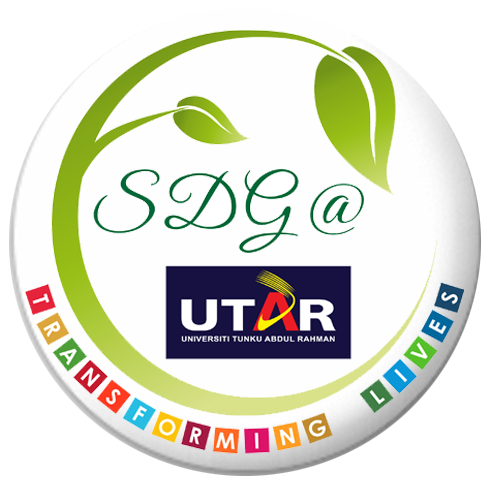 The wining UTAR team was one of the four shortlisted UTAR teams in the competition. Their project, titled Energy Link: An Interactive Energy Management Platform, aims to enable users to access real-time and historical data through a comprehensive power and energy information centre. “This basically enables collective participation of occupants within a building to use electricity wisely through our interactive energy management platform” said team leader Hau. Another captivating feature of the project is Peak Deduction, which aims to reduce electricity cost for buildings. “We encourage students from UTAR to participate in such competitions as it not only improves technical skills, but also gain industry exposure which is relevant for our future career development” said Hau. “I really enjoyed presenting our project to the panel of judges as well as talking to visitors during the competition” added team member Chok, who strongly feels that such competitions are good in helping participants to reinforce communication skills. The winning team members also expressed their gratitude to their supervisor FES Senior Lecturer Chua Kein Huat for his endless support and motivation. “Innovate Malaysia is a great platform for students to explore the problems and needs of industries and come out with ingenious solutions. Here, we have gained experience and lessons from previous competitions, and we managed to strengthen our weaknesses and make our project more practical and comprehensive. Finally, our hard work and effort paid off this year.” said Chua. IMDC 2014 was a multi-disciplinary engineering design competition open to all final year undergraduates, engineering or computer science students within Malaysia. The competition, which was held through collaborations between government, professional bodies, and the industry, aimed to promote an innovative culture among engineering graduates while enhancing their knowledge and skill sets in practical engineering. 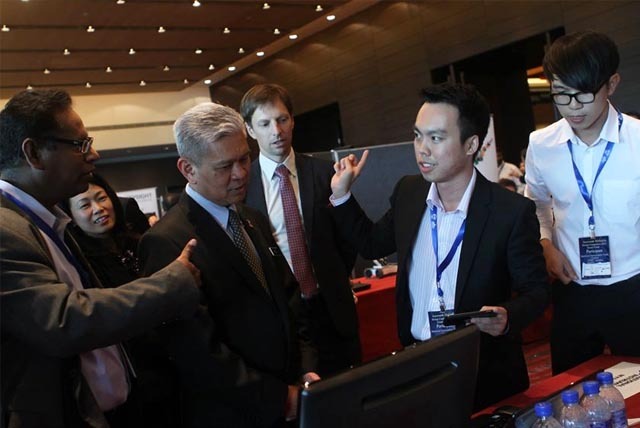 The competition acted as a platform to showcase the brightest talents in Malaysia’s engineering faculties, and provided a channel to participants for further research, product development, and commercialisation opportunities.